This book is fairly confusing. The Midnighters is about a group of four - now five teenagers who have these abilities to live in a secret hour only occurring at midnight called "The Blue Hour". It turns out there are actually 25 hours :s, it just goes by sooo fast that we cant see it, but for the Midnighters its like a new world for them. Everybody freezes and its just them. Except for these creatures called Darklings and slithers, though they haven't really been described yet. The book takes place in Bixby, Oklahoma. Btw, the group got this ability because they were all born at the stroke of midnight. Jessica Day (main character) . She moved here from the big city Chicago to a tiny town. Jessica is 15, and has a little sister named Beth. When she first gets to school she is considered popular. She has no idea that she posses the power to see into the blue hour. Desdemona aka Dess. She is considered a loser at school along with rest of the crew. Dess is SUPER smart, smarter than a computer, but she inherits it from her family. she takes advanced placement Math along with Jessica. Her power during the blue hour is predicting if something or someone is not how they should be. Like if a creature is about to attack because something disrupt it, or if a new Midnighter came into town. (hint hint: JESSICA!) Dess also can easily come up with thirteen letter words, thirteen is a lucky number in the town of Bixby. She can locate and create weapons when dealing with darklings and slithers. Rex Greene. He is considered a loser also, and he often gets bullied at school, but this year everybody has moved on and ignores him. Rex wears super thick glasses and without them everything is just a blur. Except on the first day of school when he meets Jessica Day, she is the only thing that isn't blurry with without his glasses. Like, with his glasses on she is blurry. but Without his glasses on, she is crystal clear !!!! Also with the other midnighters, it is like that too.. and as well as anything else from inside the blue hour, for he doesn't have to wear his glasses in that time. Jonathan Martinez. He was too a new kid 2 years ago. Jonathan never stops eating, though he is very fit! He didn't really hang out with the midnighter group before Jessica came, but now that she is here they all hang out. Jonathan and Jessica have a little thing going on between them, but we do not know a lot about Jonathan. Melissa. She is quite powerful, and a snob. Her power has to do with Mind thingies. She is telepathic and she also has other abilities that haven't been described yet. She can also manipulate the mind and sense things such as behaviors and if something is Good or Evil. She doesn't really like Jessica so far.. She thinks she doesn't belong with the midnighters because she is so "11:59". No one likes Melissa except for Rex. They have known each other since they were 8. We do not know a lot about her yet. Rex gets bullied and meets Jessica, Jessica gets lost. 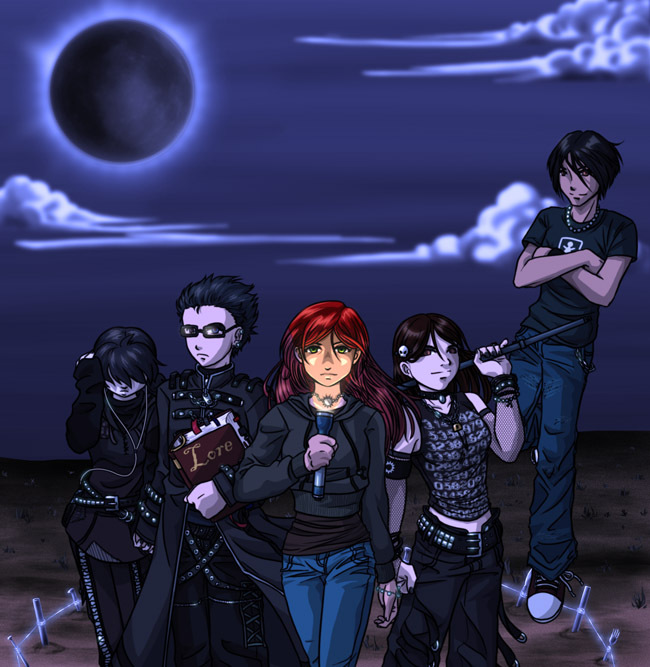 Then the midnighters Discuss whether she is one of them or not because of the whole glasses thingy with Jessica and Rex. Jessica become Popular in the part of the book cuz she is new and such. The school is sooo small so when someone is new, everyone knows. / This part is where dess and jessica meet in advanced placement math, they talk and Dess is trying to hint that Jessica is a midnighter.. " Yeahh, so the water here is bixby is kinda weird, it tastes funny and gives you weird dreams. I grew up here and i still think it tastes funny" - Dess … HAHAHAHALOLOLOL :) but she obvs didnt get the hint..
Jessica wakes to a storm stopping very fast. it takes a moment to realize where she is and such because of her moving. (btw, its midnight) she goes outside and the rain stops in midair. ITS SOO COOL! then when the gets close enough, then just go onto her skin like regualr rain. Jessica starts to consider what dess said about the funny dreams. Then the sky turned blue… hmmm thats probs where the "blue hour" came from =P . She ran back inside and went back to bed thinking this was all a dream. then she wakes up and BAM! she sees her soaking wet sweatshirts from the frozen-in-the-air rain. :) / This part of the book, her powers are decribed as being able to taste items like school.. "As she got closer, the taste of school creped into her mouth" HAHAH . She cant stand when people touch her bare skin, and she needs to wear headphones to block out what the other people are saying in there mind cuz she can read minds. Here Jessica and some of the other Popular friends discuss why Bixby is so weird for the school paper. Jessica gets creeped out. Jessica talks to Dess in the library that Dess is sensitive to light. Photophobic. Jessica gets even more creeped out about how there are 13 of everything. Council members, 13 points on the official star thing, 13 letters in Bixby Oklahoma. Then dess said Are you having funny dreams yet? Setting Jessica to FREAK OUT mode :).. then dess said well youll find out if it was a dream in 43,207 secs. / Jessica meets Johnathan, Nothing special, except they were fliritng a lot at lunch time and at the lunch table where they met. This is about the blue hour. Jessica realzes its real, then she found out that regular humans are frozen durning the blue hour. Then the darklings and slithers attack Jessica when she follows this cat. Then the other midnighter use their powers to save her, well, mostly dess cause she creats weapons and such. / Melissa signals that something isnt right so there is this giant battle with the whole midnighters crew. Jessica is still un-aware of her Fire/Electric powers. so far jessica has managed to get to two nights being a Midnighter . But now she is tottaly confused and scared because of the things that tired to attack her . she still thinks its a dream, i would too . but she went to a tree that she had been to the previous night, then saw the marks of the slithers .. btw, she was on a persons lawn. Then the lady whos tree was on her lot started to scream at Jessica, and said " GET OFF MY LAWN AND DONT COME BACK TONIGHT ! " … dont come back tonight ?!!?!?!?!?!? does she know about the midnighters ?!?!!?!?!?!? / Jessica agreed to meet Rex, dess and melissa at the museum to discuss things and explain about the midnighter thingy. in the car, everyone (not jessica) was trying to figure out jessicas ability, everyone has one. but so far we know she isnt a polymath like dess ( super good and crunching numbers or finding out certain words that are ___ letters ) nether a mind reader or else Meslissa would have "sniffed" her out already. and definetly not like rex where she could see marks of where the dark have touched the place. rex can see cuz without his glasses dark marks are clear, but with his glasses on, their bluryy. Johnahan is an acrobat. he can defy the laws of gravity. but jessica is not that either….. So they meet up at the museum and discuss. Jessica is freaked out now, and she has sooo many question to ask. Basically they talk about defense against the blue noon things - metal untouched by anything in the dark. - the 13 pointed star.. crucial to being protected. - steel and any other new metal . Now her and rex are out to meet jessica, they feel she is unsafe in her room during the blue hour. All of the darklings and slithers are out when jessica came to town. They are questioning wether she is a good person or something unnatural. They are gonna take Jessica to the "Snake Pit" To figure out her special power, but she is grounded and it takes more than an hour to get there. so they need to figure out a plan to sneak her out.